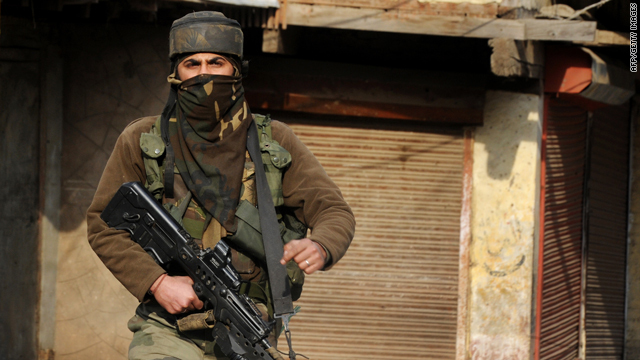 Srinagar, Indian Administered Kashmir (CNN) -- An Indian army officer and two troopers were killed Tuesday as Indian security forces battled militants in a daylong firefight in the northern Kashmir town of Sopore. Farooq Ahman, the inspector general of police for the Kashmir zone, said at least one militant was killed. He left open the possibility of more casualties. An Indian trooper was also wounded. A senior police officer said the firefight erupted after Indian troops surrounded two houses in Sopore, about 34 miles (54 km) from Srinagar, the capital of Indian-administered Kashmir, on a tip-off that heavily armed militants were holed up there. Indian security forces blasted the houses, but a deputy inspector general of police, A.Q. Manhas, said they came under automatic gunfire from a third house. Sopore is a picturesque town known for its apple orchards.